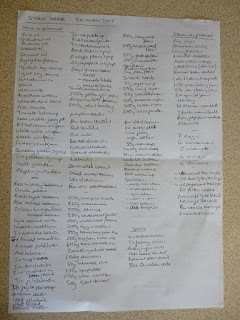 I’d like to pretend my approach to a stock check and meal planning is very organised, but really it’s a bit chaotic and life tends to intervene. In my head, I intended to do a stock check on Sunday morning, jot down some meal ideas, check the recipes, write a shopping list and zip down to Morrisons to use my voucher. In practice all I managed was the stock check, partly due to pausing to take photos, noticing the state of the cupboards, cleaning them and taking photos again. Then we headed off to the Bo Peep Sheep picnic and a barbecue. 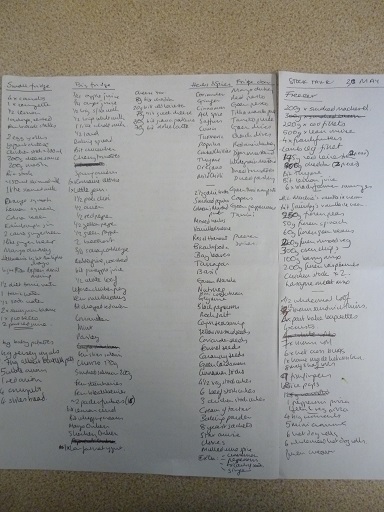 So here’s my high-tech approach to making a stock check in the first place – a few pieces of paper and lots of scribbling. 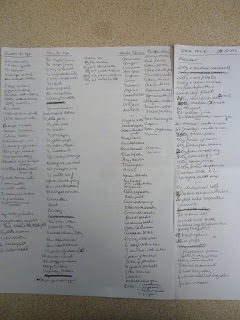 The next day I continued making a list of meals, and dug out a whole pile of magazines, recipe cards and cook books, then got over excited about far more recipes than I could actually cook. 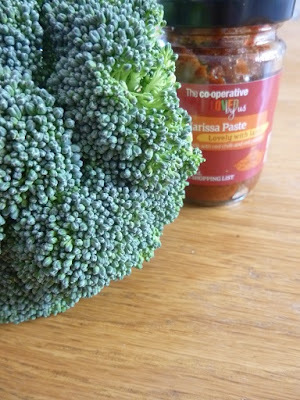 I even got out the calendar with great intentions about matching up different days to different meals, and varying options between eggs / veggie / mince / fish / bacon so we didn’t eat lots of any one thing in the same week. But that hasn’t happened either. And by the time I’d come up with a gazillion more recipes for a chicken we didn’t even have, it was two days later, the fridge was nearly bare, and pretty much the nearest we came to fresh fruit and veg was a lemon. So I played around with a shopping list on mysupermarket.co.uk, then headed off to Morrisons clutching my voucher for £6 when spending £40, in an attempt to get £40 worth of food that would stretch the store cupboard contents for as long as possible. I tried to focus on fresh fruit and veg with some dairy products like milk, yogurt and cheese, missing ingredients for baking like Stork, self-raising flour and soft brown sugar, and only a little bit of protein with ham and salami for packed lunches and a packet of cooking bacon. 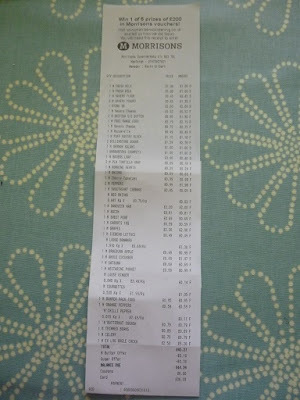 At the last minute, the bill came to just under £40, so I cracked a bought a huge chicken anyway (at least it was only £2.50 a kilo). 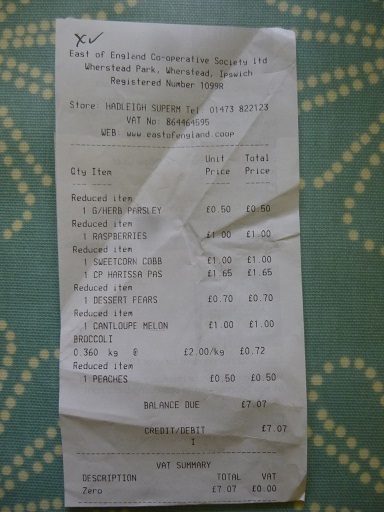 It was quite a strange experience, as although I usually buy a fair amount of fruit and veg, normally I’d buy smaller amounts more frequently rather than for example 3 cucumbers and 7 peppers in a single trolley. 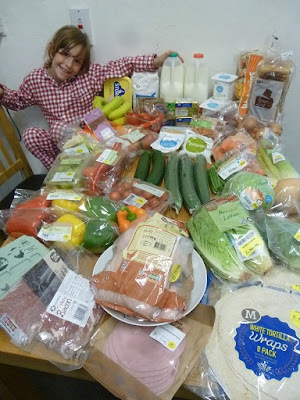 Here’s what I bought for £38.39 (plus my daughter, who was really keen to be in the photo). 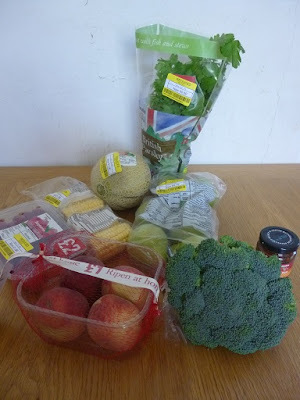 But then I realised why I shouldn’t really be allowed out, because I ended up buying a bunch of yellow-stickered fresh stuff, which is pretty ridiculous given the mountain of fruit and veg back at home. So in the end I’ve spent £45.46 across both Morrisons and the Co-op to stretch out the store cupboard challenge. This gives me a few pounds leeway up to £50 for extra milk or whatever later on.